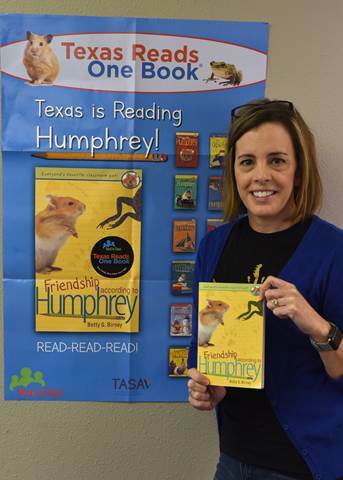 North Lamar Title 1 Coordinator Shelly Bivens reveals the book Friendship According to Humphrey that students in grades K-5 will receive at an assembly on Monday as part of the Texas Reads One Book program. The students will follow a daily reading schedule with their families that concludes on May 3. Paris, Texas, April 12, 2019 – North Lamar ISD is embarking on a special project, an all-school book club called Texas Reads One Book. On Monday, April 15, kindergarten through fifth-grade students will gather at a special assembly to watch Dallas Cowboys Head Coach Jason Garrett read the first chapter of a children’s book, Betty G. Birney’s Friendship According to Humphrey. North Lamar is joining thousands of other elementary schools in this statewide reading celebration!